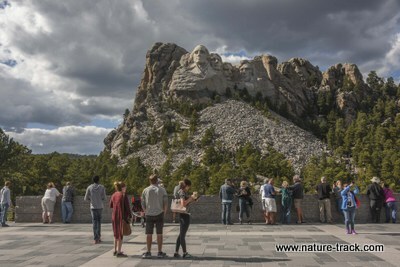 A trip to South Dakota wouldn’t be complete without visiting our most famous national memorial west of Washington DC: Mount Rushmore. 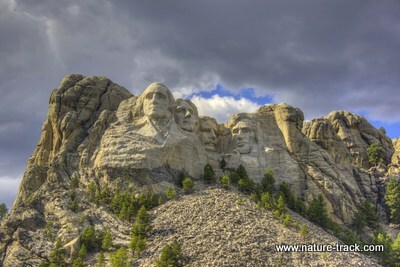 This icon has the faces of George Washington, Thomas Jefferson, Abraham Lincoln and Theodore Roosevelt carved in the granite of Mount Rushmore to represent the first 130 years of American history. These presidents were selected by sculptor Gutzon Borglum because of their role in preserving the Republic and expanding its territory. 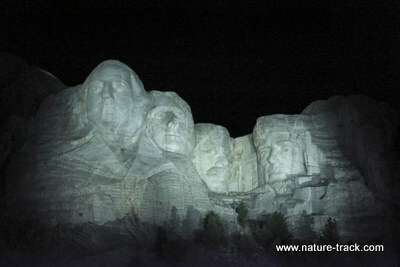 The carving of the 60 foot tall faces began in 1927 and was completed in 1941 at a cost of nearly $1 million. In today’s market that would seem like an incredible bargain but in 1927 the total budget for the federal government was $29.2 billion (our 2016 budget is $3.95 trillion). 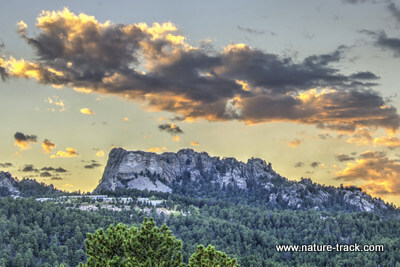 You’ll find Mount Rushmore just a few miles from the tourist trap of Keystone, South Dakota. 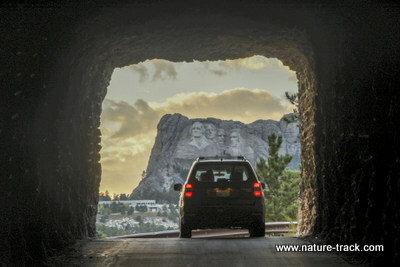 If you are coming from Custer State Park you can either go up the Needles Highway (Highway 87) and connect with Highway 284 to Keystone or you can take Highway 16A, the Iron Mountain Highway. The Iron Mountain Highway offers some great distant views of the Memorial and has several one lane tunnels and two pigtails (where the highway passes over itself). I highly recommend the Iron Mountain route. Views from the Iron Mountain Highway. 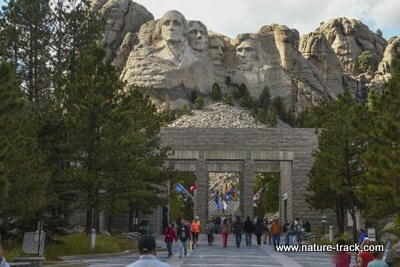 It doesn’t cost anything to get in to Mount Rushmore but it does cost $11 to park. This parking pass is good for the rest of the year so you can come back for free. That is valuable to know because you won’t want to miss the evening lighting of the monument. There is a Kiosk just inside the main court that proclaims that Thomas Jefferson not only penned the Declaration of Independence but was also responsible for the first ice cream recipe. I had listened to a biography on Jefferson and was already way impressed, but that little tidbit cinched my esteem for the man. 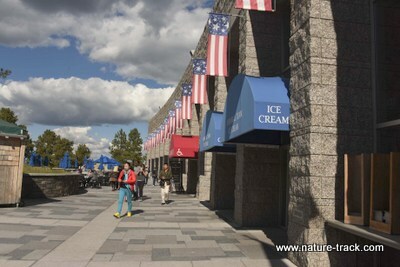 Speaking of ice cream, this is one park that actually has a food court. Although we didn’t sample the goods there (they are a bit spendy) you could get satisfied there if you were hungry and that includes, of course, ice cream. I think the best way to appreciate the monument—what it really means and the effort it took to construct it—is to go to the visitor center first. 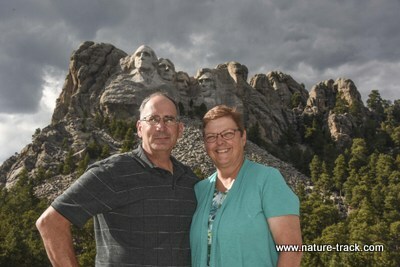 You will learn how and why the monument was conceived, how this particular site was selected and just exactly how they set about to carve these 60-foot-tall faces in solid granite. 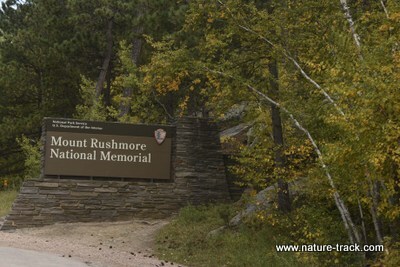 Watch the movie, read all of the displays and ask the rangers at the desk any questions you can think of. After you have thoroughly absorbed everything you can in the visitor center, then it is time to step outside and contemplate the monument. 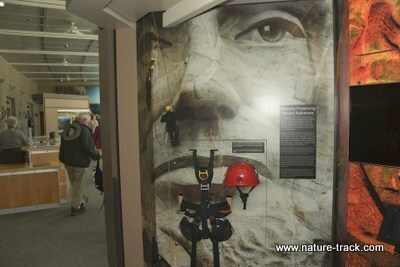 Display inside the visitor center explains how the men worked on the cliff every day. There is a big stadium type amphitheater that looks like it will seat several thousand people. This is one case where the “cheap seats” may actually be better. 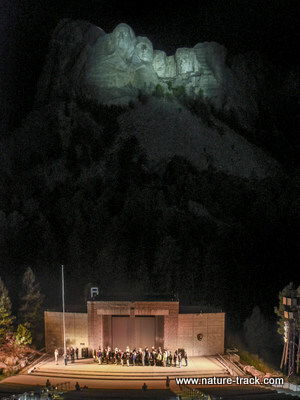 The “balcony” is actually quite a bit higher than the main stage floor and makes seeing the monument easier. I think the balcony area is better for viewing and photographing the memorial. There is also a trail, called the Presidents Trail, that goes to the foot of the boulders below the monument (these boulders were carved off the mountain using dynamite) and loops back to the amphitheater. We determined to get the most out of our parking pass by coming back for the night lighting ceremony and we were glad we did. I expected it to be just a quick “turn on the lights” deal but they did much more. 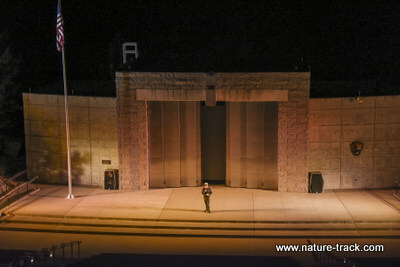 This is a natural light image of the memorial before the lights were turned on. It all starts with a moving talk by one of the rangers. Then they show a 20-minute movie that is even better than the movie in the visitor center (which is excellent). Then lights are turned on and the monument glows like a beacon and the audience joins in singing the Star Spangled Banner. Finally, all veterans of the Armed Forces are invited to the stage to help retire the colors. 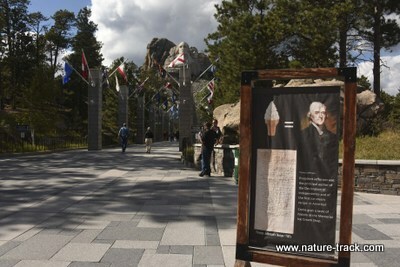 Veteran retrieve the colors of the United States of America beneath the fully-lit Mount Rushmore memorial. This was really a moving experience, one that brought my stalwart wife to open tears. I am sure she was thinking of her own father, a veteran of WWII as we watched almost 50 men and women salute the flag as it was retired for the day. Afterward, each person was asked to introduce themselves to the audience and tell which branch of service they had served in. This lighting ceremony is falls into the category of: Do Not Miss It. 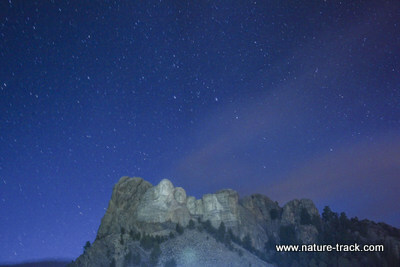 You will come away with an entirely new perspective on the monument and on your own patriotism.